Haha! That would fix everything! I was going to withdraw, but the premise of the story and the work that the DM's put into this game really got me hooked! My application is complete, if you'd like to take a look, @MemoryBeast! I would really appreciate feedback. I added a few lines to weave in @Odyssey's PC connection bit if he doesn't mind, but it's vague enough to be ignored or given significance, depending on who gets picked. Here's to an awesome game! Ahhni is not from the horde he travels with, which is instantly noticeable. His original home was below the streets of a large city in the eastern world. His flock was a group of pickpockets and con-men, with Ahhni in the latter group. His penchant for illusions fit well with the street games he would perform. And during those performances the rest of his flock would sift through the crowd for valuables people wouldn’t barter at his table of chance. As with all Kenku, Ahhni felt the call to fly just around his maturing to nineteen. What he knew should have been flight was satiated with climbing throughout the city, and Ahhni began spending his nights on the rooftops. It was during such a night of adventure that Ahhni tore his flock apart when he slipped from a roof and spent multiple nights in recovery. 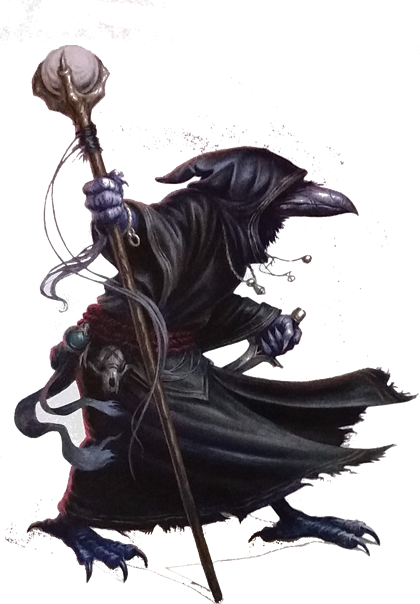 Without his cons the rest of the Kenku didn’t know how to steal without a distraction, and they moved on without him after the third night he did not return. When Ahhni found he was left alone in the city he moved out towards the west. During his travels he began to hear of a crusade led by a reckless warrior to retake strange worlds lost to a great cataclysm. Taverns would buzz about the Karredral lost magic and Ahhni decided if anything was to give him flight it would be found in the land these people had lost, and with that he journeyed into Varad’s settlement. Ahhni began again making his presence known as a performer of master illusions and games. Appearance: Ahhni is just shy of five foot nine, though a tuft of deep purple feathering on his crown puts him slightly over. He is portly for a Kenku, lending a more trustworthy look to the creature. His beak and legs are a pale yellow and, save for his tuft, his feathers are a mottled mix of black and muted silver. Personality: Though it is hard to find a personality in something without a voice, Ahhni can be seen as easily excited by wondrous things. Something of a child at heart he is a mix of cheerfully mischievous and flighty. He can tear through moods quite quickly but tends to stay optimistic in demeanor. Personality Trait: All things, beautiful and dangerous, are wonderous. Ahhni will not shy away from something he is interested in. Ideal: Though Ahhni is unfamiliar with the customs around him, he knows his are equally strange and will use this to his advantage. Bond: Ahhni's lack of flight ruined his past life, and he fervently pursues a cure to prove the folly worthwhile. Flaw: Ahhni easily forgets the customs of his new surroundings, even the sacred. Last edited by Wyrom; 04-10-2019 at 04:44 PM. I believe my application and character sheet are completed. Looking through the apps if anyone wants to do a joint backstory please let me know I would love to adapt as long as we are allowed. I've been going through these applications for days now, and it's becoming increasingly clear to me that there are too many great options here to fit in a single group. Therefore, rather than making one massive and unwieldy group, the game will begin with two separate parties of 4 or 5 players each. Those two groups will not necessarily remain separate permanently; both groups will be sharing the same world at the same time, and both will be based out of Ghol Varad, so as their initial adventures wind down, the two groups may meet up. At that point, I'm thinking that the game can adopt a more West Marches kind of feel. The groups can share information about what they've encountered in their separate explorations of Karredral, and one group may turn out to have found things that will be of great interest to characters in the other group. The groups may choose at that point to swap party members or dissolve and reform in a completely new configuration; that might also be a good point to add additional players if we find ourselves with slots to fill or want to expand the game. Over time, multiple groups will collectively explore Karredral, and potentially weave together a larger story out of their individual adventures. All of that is some ways in the future at this point, however. PbP being what it is, even a fast-paced game may not reach that point for weeks or months. For the moment, the two groups will be starting some ways away from each other, and each will already be pursuing its own adventure as we begin. Exactly what those adventures are is still under development, and will depend to some extent on which PCs are involved with each group. There are two basic outlines to the adventures, however, and which PCs will be assigned to which group will largely depend on the characters' motivations and goals, and the choices you feel they'd have made. Therefore, I need an additional piece of information from everybody who's applied. Choose one of the following options that you feel best fits what your character would do, and what you'd be interested in having them engaged in doing at the outset of the game. Option 1 - Wardens of Ghol Varad: Your character is primarily concerned with scouting the lands immediately around Ghol Varad and its outlying settlements, dealing with the threats and monsters that lurk there, and securing the safety of the Karredrim population as they try to build their new homes. Eventually, you may push further afield and explore Karredral's more remote mysteries, but your main concern right now is taming the little corner of Karredral where your people have begun to settle. Option 2 - Explorers of Karredral: Your character is primarily concerned with trekking deep into Karredral's unexplored reaches and delving into its forgotten ruins - either in search of a specific object or piece of information relevant to your backstory, or out of a general fascination with Karredral's secrets. You aren't necessarily unconcerned with the plight of the people in Ghol Varad, and you'll still be heading back there after your current scouting mission, but your primary service to the Karredrim is scouting out the lands beyond Ghol Varad to blaze a trail for others. Option 3 - You have no strong opinion on the matter; based on their backstory, your character is just as likely to be engaged in either adventure. In some cases, the answer is already pretty obvious to me based on your backstory, but there are some edge cases where I'd like your input on the matter. I also can't promise that people will necessarily get the group assignment they choose; for reasons of party balance or plot compatibility, I may need to assign people to the adventure that wasn't their first choice. If that happens, remember that the groups can change down the line, and characters engaging with one goal right now could pursue the other goal later. So that I don't have to go digging back through the applications, please give me your answer in a new post. Just saying "Option 1," is fine, but if you'd like, you can also describe your reasoning and preferences in more detail. Thank you to everyone. I anticipate being able to make a decision about groups in the next few days. Last edited by MemoryBeast; 04-10-2019 at 10:11 PM. Krumir will definitely fall under Option 1, seeing as he has a tribe to secure and take care of in the settlement, but that doesn't necessarily mean he'll hesitate to explore given the right motivations. This is a splendid idea, @MemoryBeast! A West Marches type game with a coherent, central plot sounds perfect. Kudos to you and to all who submitted their awesome apps! Last edited by Hundur; 04-10-2019 at 10:15 PM. Aukan is more on the Option 2 end of the spectrum, but his loyalties to Taa could pull him into Option 1 as necessary. Last edited by Nasrith; 04-11-2019 at 09:25 AM. Devis is definitely an option 2 sort of adventurer. Haha, Uriel fits squarely into option 2. Allowishus wants no part in either mission. But that is kinda his entire background. He is a sage and historian. Option 2 seems the more likely of the choices, but I have no strong opinions either way. Jasper's main motivation for heeding Varad's call is to see what treasures can be found in the ruins of Karredral. He would definitely choose option 2. It's kind of a complicated answer though. On one hand, I can make a strong case for one option, but a stronger case for another option. So that makes it easier where I'm going to go with Option 3. Not because I don't have an opinion, but because both are equally valid for Axis. He doesn't have anything driving him to a specific direction once he gets there, and just wants to see what Varad is about and capable of in either situation. Both have equal chances of moving him in the path for his goals. That being said, we just doubled our chances at getting in, which should make it a little easier for coming up with some character related hooks and familiarities. Vogul could be more concerned with Option 1 since his family is habitating Ghol Varad. Clever Guide's backstory is pretty obviously linked to option 2. That said, he doesn't know how or where his visions will manifest and just believes he needs to be in the area. Right place right time sort of thing. So I guess option 3 for me.